Ugh, it was a tough day for the bulls on Wall Street. While the market’s major indices are still far from bear country, it’s been a tough few days. The Dow fell 700 points, while the S&P 500 and Nasdaq each fell about 2.5%. Let’s look at some must-see stock charts as a result. For simplicity, let’s use the SPDR Dow Jones Industrial Average ETF (NYSEARCA:DIA), which fell 2.8% Wednesday. The DIA knifed through the January highs. I’m not trying to be a fear monger here, but I want to point out that, just because the Dow’s down 700 points, doesn’t mean it’s at a bottom. The blue box on the left in February is the same size as the one from Wednesday session. In February we had the implosion of several volatility-related instruments, which is not the case this time around. Short of an explosion higher in bond yields, I don’t expect a repeat of February. For the DIA, I would love for a pullback to the $255 area. We’ll run into a big prior resistance level and have the 100-day moving average just below at $253.50. That will at least give us a defined risk/reward. Often known as the “fear gauge,” the CBOE Volatility Index (INDEXCBOE:VIX) is bursting on Wednesday. After bumping up against the $17.50 level for a few sessions, the VIX exploded 35% on Wednesday and climbed above $21. Now here’s where the party starts. 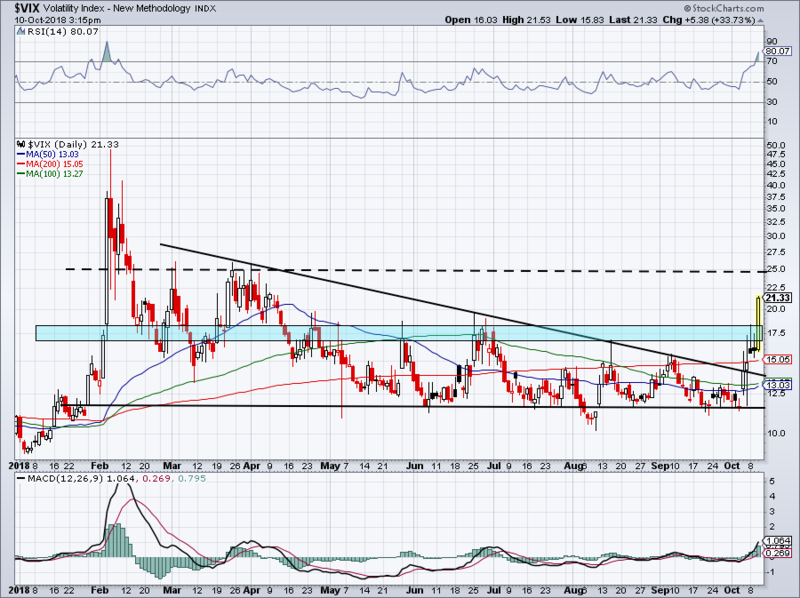 Should the VIX trade in the low-$20s for a few days, it will remain a bumpy and turbulent ride for traders. Over $25 though and it will get downright scary. But note that over the past year the VIX hasn’t been able to sustain above this level. Sure it popped above it a few times, but ultimately it wasn’t able to hold up over it. The only time it did? February. But if we get a run over $40, know that it’s unsustainable. Particularly in this environment. The Nasdaq was the hardest hit index of the three major indices Wednesday. Like the Dow, we’ll use the PowerShares QQQ ETF (NASDAQ:QQQ) for simplicity, which fell almost 4% on the day. After holding up nicely near the 100-day moving average, the QQQ dumped below it Wednesday. Similar to the Dow, I would like to see a pullback to that last big resistance area. In this case, it’s near $170 for the QQQ. Getting there would require breaking below the 200-day moving average, which is less than $1 above our target. 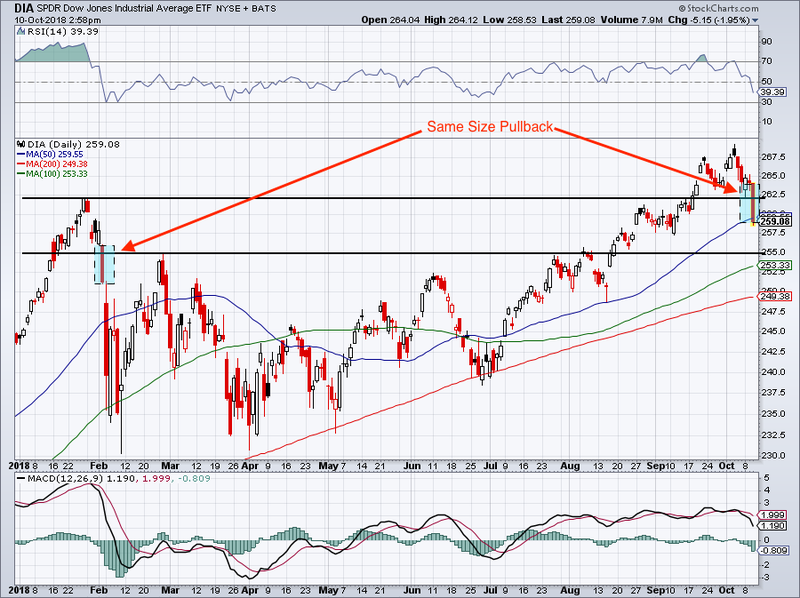 In any regard, it will require another 2% to 2.5% pullback. It could give us a good buying opportunity in names like Apple (NASDAQ:AAPL), Amazon (NASDAQ:AMZN), Alphabet (NASDAQ:GOOGL), Adobe (NASDAQ:ADBE), Salesforce (NYSE:CRM) and others. Let’s look at some individual names. Overall, dividend stocks, REITs and blue-chip names are holding up best. Walmart (NYSE:WMT) is among that group. Earlier this week we took a closer look at WMT stock, deciding whether to buy ahead of the holidays or to pass. 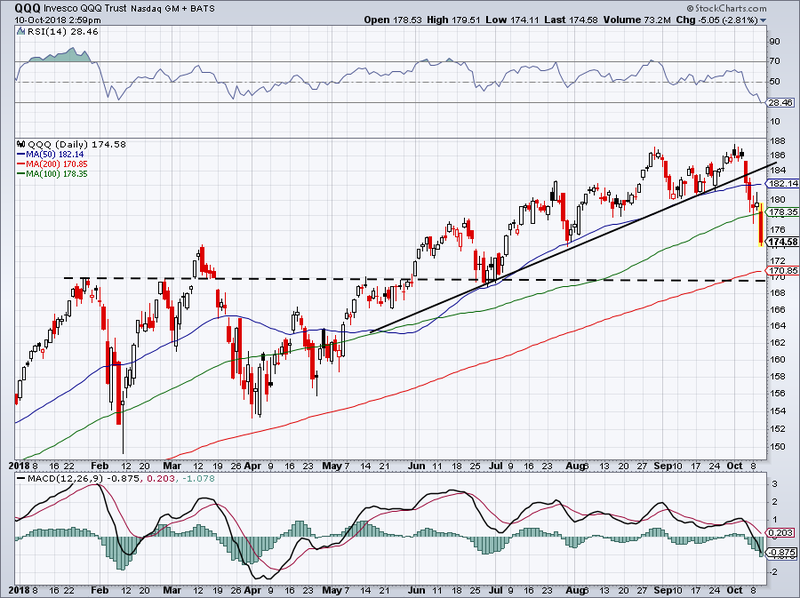 Specifically, we noted the downward channel it was in (blue lines) and said a breakout from this trend would be a buy. Now that it has, investors can hide out in this name. 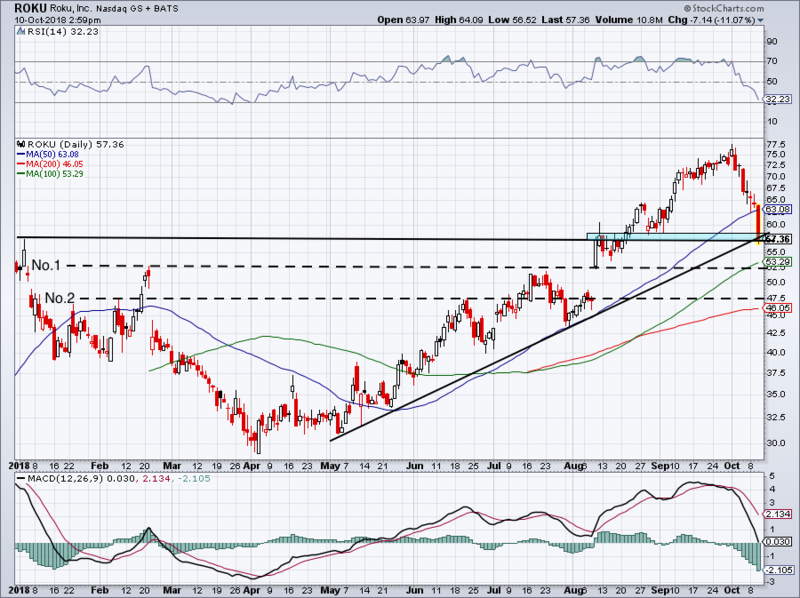 Below $93 and I would likely stop-out of WMT. But if the markets can recover, $100 then $108 is technically possible. Over the 50-day, downtrend resistance (blue line) and uptrend support (black line) makes WMT one to hold. This growth monster took a whacking on Wednesday, falling more than 11%. But that doesn’t mean it’s all over for Roku (NASDAQ:ROKU). I’m of the belief that eventually this wave of selling will end and companies like Roku will go back to flourishing. Still, shares are quickly down about $20 per share or 25% in just a few trading sessions. Aggressive bulls with a long-term time horizon can nibble near current levels — gulp! — while more conservative bulls can dip their toe into the water near $52 to $53. 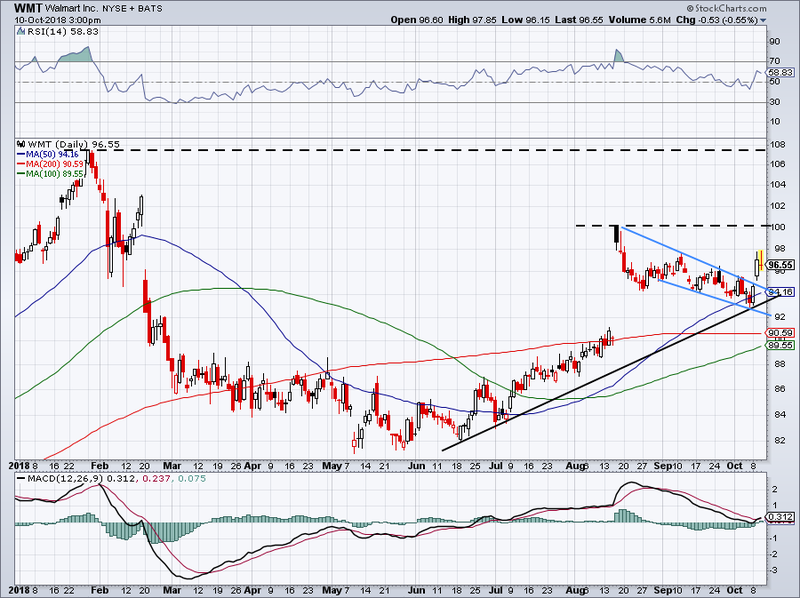 That would put Roku near the earnings-fueled gap from August and the 100-day moving average. Beyond that, the $47 to $48 area would be considered a must-buy for me, down near prior resistance and the 200-day moving average. Bret Kenwell is the manager and author of Future Blue Chips and is on Twitter @BretKenwell. As of this writing, Bret Kenwell is long AAPL and CRM. Article printed from InvestorPlace Media, https://investorplace.com/2018/10/5-must-see-stock-charts-dia-qqq-vix-roku-wmt/.